1) Bamboo/reed leaves - 50 sheets. 2) Glutinous rice - 1 kg. 3) Chinese dates - 250 grams. 1) Take a large bowl and fill about 2/3rd of it with water. Immerse the rice and the dates in it. Keep submerged for 12 hours or more to soak them thoroughly. 2) Wash the leaves. Use a chopping board for laying them out. 3) Fold the leaves flat at the leafstalk to make a sheet. 4) Fold the sheet round in the middle to make a funnel. Ensure that both ends of the sheet are laid over each other in one direction. 5) Now make the rice dumplings. About 1/10 kg. of rice and 6 dates should be used for each dumpling. Cover the dates with rice. That way not too much syrup would be lost from them during cooking. 6) Fold up the leaves to close the open side of the funnel. Tie the leaf bundle with a band made of twisted leaves. See to it that the bundle is tied neither too tight nor too loose so that the ingredients are well cooked. 7) Carefully place the dumplings in a pot with water over. Make sure they are pressed and kept undisturbed while being boiled. 1) Chicken meat - 300 g, diced. 2) Red bell pepper - 1/2, diced. 4) Green bell pepper - 1/2, diced. 5) Chili Garlic Sauce - 2 tbsp. 7) Blended Sesame Oil - 1 tsp. 8) Premium Oyster Flavored Sauce - 1 tbsp. 9) Corn starch - 1 tsp. 1) Blend chicken meat with marinade. 2) Take a medium-sized pan and stir-fry chicken in 2 tbsp oil on it. Fry until it is done. Add bell peppers, Lee Kum Kee Chili Garlic Sauce and heat through. Serve hot. 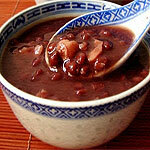 1) Dried red beans - 2/3 cup. 3) Oil - 1/4 cup (for frying). 4) Water - 2 cups (for boiling). 1) Wash the beans thoroughly and place them in a medium-sized saucepan. Soak these in water overnight to lessen the cooking time. 2) The following day, boil the beans-water solution. Simmer for about 2 hours, until the beans have softened. Add more water if required. Drain. 3) In a blender, process the beans until smooth. Remove from the blender, and stir in the sugar. 4) Get a wok/frying pan and heat the oil in it. Fry the beans for 10 - 12 minutes on medium-low heat until they are dry. 5) Using the back of a spatula, press the beans gently to form a paste. 6) Store the beans in a sealed container in the freezer/refrigerator. NOTE: Throw out any damaged beans. 1) Shitake mushrooms - 15 large, dried and stems removed. 2) Pork - 150g, grounded. 3) Chinese salted turnip - 1/4 slice, rinsed and chopped. 4) Soy sauce - 1 tsp. 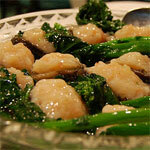 5) Oyster sauce - 1 tbsp. 6) Sesame oil - 2 tsp. 7) Canned water chestnuts - 6, finely chopped. 9) White sugar - 1/4 tsp. 1) Remove stems from mushrooms. Throw them off. 2) In a medium-sized bowl, thoroughly mix the pork, turnip, soy sauce, water chestnuts, salt, and sugar. 3) Spoon stuffing tightly into mushroom caps. Arrange these in a steamer basket, over boiling water putting the stuffing side up. Cover, and cook for about half an hour (or until done). Serve hot.